This archive holds all posts form January 2007. I’m a big fan of David Maister’s approach to creating a successful professional services company. Effective leadership is an essential ingredient to his approach. Real leadership is earned, not bestowed as an byproduct of one’s position in an organization. Many managers have discovered that the technical skills that have propelled them into management are not the skills they need to be successful as leaders. People vote with their feet every day, especially in an organization that is staffed by knowledge workers with highly valuable expertise and skills. If these people don’t have confidence in the leadership of the company they work at, if they don’t trust them or like them, they can easily take their talent elsewhere. That’s why today is a happy day for me. Today I was able to recognize one of those true leaders people choose to follow, who inspires loyalty and encourages people to excel. As I try to walk the talk myself, I thought I’d share with you the email that I sent out earlier today announcing the promotion of one of my colleagues, Keelan Green. 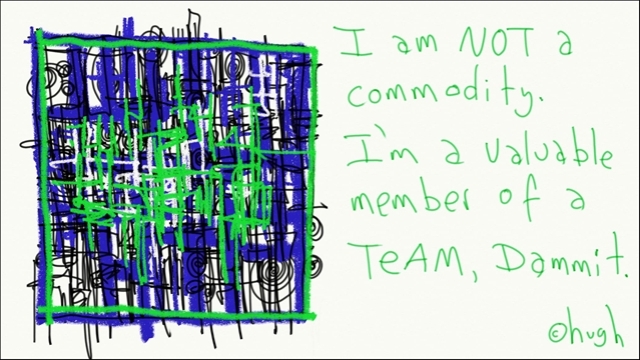 I hope that it conveys the right signals to the people with whom I work about what is important and what is valued in our organization. You’ve probably noticed that the Ottawa office has been on a real roll during the past year. We’ve added some great new consultants (you know who you are!!! ), done great work for clients who not only continued to place their trust in us but also provided positive referrals to other clients, and won additional business through straight-ahead competitions. Equally important, the sound of laughter and the sight of smiles is a regular part of the work day. Every person working in Ottawa has made a real contribution to this success. And I thank you for this. Today, I want to recognize the particular contribution of Keelan Green. Keelan has been our leader in many ways for the past two years. He leads us literally in being the first person in the office most days. He leads us in showing how to use our work time effectively to get results for clients. As a colleague, I know that Keelan can always be counted on to pitch in when I or someone else needs help. And when the chips are down, he won’t give up until we’ve achieved what we set out to do. Keelan can also be counted on to show us how to maintain a good balance in our lives (because it’s not only about work.) He taught us that summer Thursdays are for golf. And beware the person who tries to cut into that time! But most important, we know that Keelan always cares. He cares about our company, the people who work here and making sure that together we are successful. Because if we are successful we can all realize our dreams. This is not an end, but the beginning of an even more exciting year that lies ahead. In the coming days, Keelan will be working with both the Thornley Fallis Communications and 76design teams to lay out plans to continue to excel in each of our practice areas while also exploring the potential synergies that can be realized by combining our different areas of expertise. I know that he’ll be talking to each of us about the opportunities for us individually to grow and contribute to our collective success. Congratulations Keelan! It’s your time. * Thanks to Hugh McLeod for the great drawing. Always a source of inspiration. Are you interested in knowing more about the public relations consulting industry in Canada? Then you will want to subscribe to a new blog launched by the recently formed Canadian Council of Public Relations Firms (CCPRF). 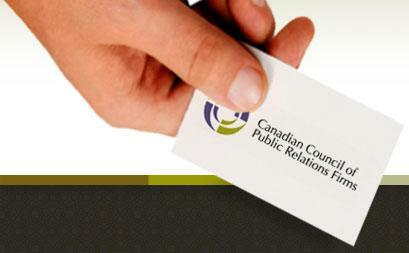 The CCPRF is the organization that represents public relations consulting firms in Canada. Its membership is restricted to the principals of the firms. So, it will be worth watching this blog to see if it develops as a place where the senior officers of its members talk about important issues facing the industry. Disclosure: If you’ve wondered why I haven’t posted on ProPR for the past several days and if you noticed the name on the first post on the CCPRF blog …. Thornley Fallis is a member of the CCPRF and I spent my spare time the last few days finalizing the CCPRF blog and getting it up and operating. So, I’m hopeful that this new blog will in fact flourish. Courtney Rainey has been headed up by founder Susanne Courtney and Sharon Rainey. They will join Cohn and Wolfe as Senior Vice Presidents. Both Courtney and Rainey have played an active role in founding and shaping the Canadian Council of Public Relations Firms. Their energy and dedication will be missed by the other members of the CCPRF. * Thanks to Julie Rusciolelli for the tip to this move. TORONTO, Ontario – January 16, 2007 – Cohn & Wolfe | Canada announced today the acquisition of Courtney Rainey Group Inc. and the integration of its 13 employees with the 55 employees of Cohn & Wolfe’s Toronto office. The new organization will offer clients of both firms access to an enhanced team of public relations professionals and to a broader array of communications services. It will operate under the Cohn & Wolfe name, leveraging the brand’s strong reputation for creativity and communications excellence as well as its international network of offices. The merged firm’s clients include leading corporations from the corporate, financial, healthcare, technology and consumer products sectors. Founded as Courtney Public Relations Inc. in 1999 by Susanne Courtney, the firm became Courtney Rainey Group in 2002, one year after Sharon Rainey joined as partner. The move will see Susanne Courtney and Sharon Rainey become senior vice-presidents of Cohn & Wolfe and members of the management team led by Ms. Panasiuk. In October 2006, Cohn & Wolfe | Canada acquired Extend Communications in Calgary which now operates under the name Cohn & Wolfe | Calgary. With the acquisition of Courtney Rainey, Cohn & Wolfe | Canada now has 85 employees in its Toronto, Montreal and Calgary offices. It is wholly-owned by RES PUBLICA Consulting Group, which is also the, parent company of NATIONAL Public Relations. Cohn &Wolfe | Canada is an affiliate of Cohn & Wolfe Worldwide, a leading international firm with 12 offices around the globe, providing business results and marketing communications solutions to clients in a wide range of business sectors. The PR community online is still growing. According to our official scorekeeper Constantin Basturea, the community almost doubled in 2006 to 630. Terrific, right? One would hope that with more PR blogs, the industry would be increasing it’s awareness of social media. More PR bloggers means more individuals telling their friends and colleagues, “Check out my blog.” Sadly, the second most-trafficked PR blogs is the self-appointed potty-mouthed ombudswoman of the PR community, Strumpette. Even when we do good, the bad stuff seems to stand out above the rest. Well, it seems that Strumpette, used to visiting criticism on others, has a pretty thin skin. Chris’ post is time-stamped 11:00 January 12. At 11:15, my telephone rang and the first words I heard were, “Joe, it’s Brian Connolly.” Brian wanted to complain to me about what Chris had written. You see, I’m Chris’ employer and Brian felt that I was responsible for Chris’ scepticism about the merits of Strumpette. Brian and I had a good long conversation. He made his points. Articulately. With some passion. He argued the importance in society of dissension. I listened and did not disagree with that. But I did tell him that I have a problem with people who attack the character of others from behind a veil of anonymity. We had a good conversation that gave me some points to consider, but that did not persuade me to endorse Strumpette’s approach. Well, a few minutes ago, I felt the fury of a Strumpette scorned. One of the anonymous Strumpettes has just written an attack piece targeted squarely at me, my firm and our approach to social media. None of us will find total agreement with everything we say. There is merit in thinking through and expressing ideas and having them challenged. That’s how we learn. That’s how we move forward. That’s how we grow. Social media provides channels through which new voices may be heard. Some will be intelligent and perceptive. Some will entertain. Some will educate. Others will seek to titillate and to appeal to baser instincts. So, I’ve just had my Strumpette moment. It’s not nice. I have some scratches. A short plug for Thornley Fallis: We’re searching for senior people in our Toronto office. December was a great month for our health care team. They retained a major account and won an assignment from another new client. But this means more work for us now. So, we are looking for a senior communicator who can help us to deliver outstanding work for these clients. Michael O’Connor Clarke also is searching for an Account Director who will help us to continue to grow during the coming year. Account Directors are our top tier practitioners. So, this is a great opportunity for someone who has already demonstrated success and now wants to take a leadership position with a growing consulting firm. If you know of someone who might be interested in either of these positions, please ask them to look at the job descriptions on our website. We’ll work hard to make this a smart career move for the right person. We’re kicking off the 2007 Third Monday season with a special panel of Ottawa-based social media experts who will lead a discussion of what’s hot, what’s working, what’s not and what’s ahead. Colin McKay, Ian Ketcheson and Brendan Hodgson will prime the discussion with their views and perspectives. Then it’s over to us for a wide open discussion of what we think is on the horizon for social media this year. In government. In business. What lies in store for PR and marketing? New location: We’ve moved this session to the Clocktower Brew Pub on Bank Street south of the Queensway. I upgraded yesterday afternoon to WordPress 2.0.6. I have Akismet installed. And now Akismet is treating ALL Comments on my site as SPAM. Legitimate comments are being sent directly into the SPAM folder and not showing up in my Moderation queue. Has anyone else had this problem? Do you know of a fix for it? I still don’t quite know what to make of Strumpette. Sometimes the ad hominem attacks are contemptuous. Sometimes, the insight is penetrating. But today, she demonstrated why I should view her blog as an ongoing send up. Pro PR ranked within spitting distance of bloggers like Jeaneane Sessum, Jeremy Pepper, David Parmet, Mike Manuel, Stuart Bruce and Susan Getgood? It must be April Fool. But thanks, Amanda, for bringing a smile to my face. It’s good to know that you care! We have a great speaker – Mark Evans – to kick off Third Tuesday’s 2007 spring season. Mark writes highly respected blogs on telecom and technology and web 2.0 in Canada. He also co-hosts a popular weekly podcast, Talking Tech with Kevin Restivo. Mark’s day gig is Vice President of Operations at b5media. Before joining b5media, he was a newspaper reporter – most recently at the National Post where he wrote about the Internet and the telecom sector. Mark also has earned his stripes as a technology entrepreneur. In 2001, Mark co-founded Blanketware Corp., which developed natural language navigation technology for online services. At Third Tuesday Mark will draw on his experience as a journalist, tech entrepreneur and social media network executive to give us a unique perspective on social media and its evolving relationship with mainstream media, public relations and communities of interest. If you are interested in being part of the discussion with Mark, we’d love to have you join us. Sign up for Third Tuesday on meetup.com and RSVP that you plan to attend. You’ll meet a great group of people who share a passion for social media. Dave Forde is conducting a survey of Canadian corporate bloggers perceptions of blogging and how it fits into their communication and marketing strategies. He’ll be publishing the results on his blog. The survey should take less than five minutes to complete. So, if you are a Canadian corporate blogger, please go to the survey link in Dave’s post and then watch his blog for the results.